When schools, sports teams, civic groups or clubs begin their fundraising efforts this year, instead of doing the same fundraiser that every other group is doing, why not consider offering Christy’s Candles? Christy's Candles has been helping groups with their fundraising efforts since 1989. We offer a very generous return on all candles sold by your organization. Our candles practically sell themselves and make ideal gifts for Christmas, birthdays, weddings, house-warming parties or to add a pleasurable touch in your own home. What distinguishes us from other companies is that we are a family owned and operated business. Our candles are some of the finest in the industry today. We make all our candles with pride and the highest quailty, inspect each one before it leaves our facility. 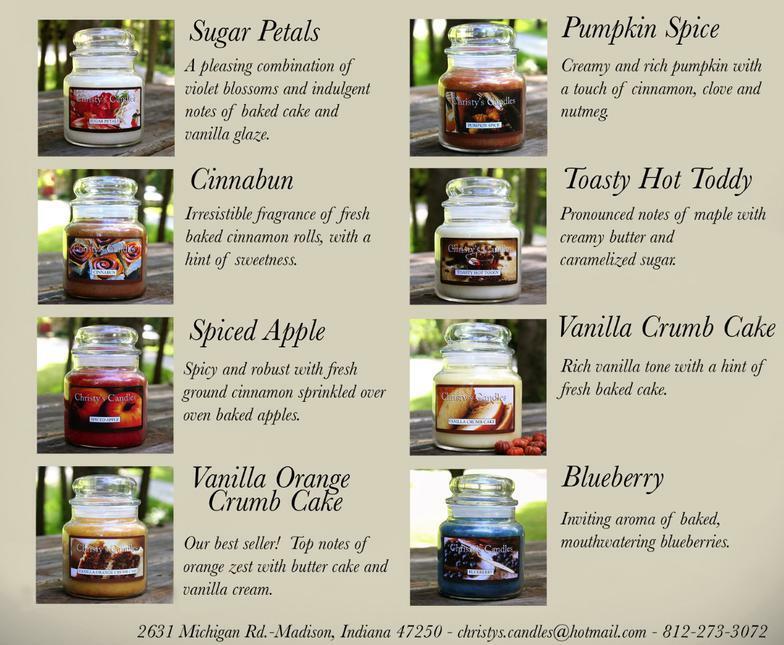 We help you by offering high-quality candles for fundraisers across the United States. Christy’s Candles also backs our products with our Satisfaction Guaranteed or your money back guarantee, and the best in customer service. Not only do you get maximum return on your sales, We provide you with the sales and order sheets you need to easily show and sell your fundraising products. You can begin to enjoy exceptional results and profits from your fundraising project by contacting us for your fundraising package. Don’t wait until the last minute, let us know about your interest now so we can begin working with you to make your fundraiser a success. All you have to do is give us a call so we can send your order forms and products to you. Our friendly sales staff will be glad to answer any additional questions you may have about products or sales opportunities. We can be reached by phone Monday-Friday 8:00am-5:00pm EST at 1.812.273.3072, by email at christys.candles@hotmail.com or by competing the inquiry form below. All of us at Christy’s Candles look forward to working with your organization to help them to reach their fundraising goals!